Ultimate Castle Challenge, originally known as Castles - Masterpiece Set, is the last extra level of Super Mario World 2: Yoshi's Island and Yoshi's Island: Super Mario Advance 3. Part 1: Caged Ghosts and a Mace Guy are present. Part 2: Moving platforms over and under spikes and thorns are present. Some Spear Guys appear here. Part 3: Flatbed Ferries under and over thorns, super-fast platforms that head straight into spikes. 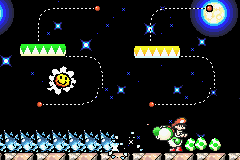 A Yoshi Egg container appears in this room, as well as some Dangling Ghosts. Part 4: The player rides on a flatbed ferry and avoid being knocked by Sluggers and Green Gloves. Part 5: The player ground-pounds through a long tunnel and avoid being knocked into thorns lining the walls. Part 6: It is similar to Part 5, but with thorns absent. Part 7: The player rides an underwater flatbed ferry going under thorns, and the player reaches the goal for the final part. French La Compile ! The Compilation! Italian Castello tranello! Trap castle! In the second area of this level, the tracks that the Flatbed Ferries travel on spell the word "YOSHI" in worldwide releases, but in Japanese versions, they instead spell "YOSSY" (an alternate romanization also used for the box art). This page was last edited on March 20, 2019, at 00:57.